AIM’s insurance operations and systems expertise in alliance with Coriendo LLC software offers an unprecedented benefit in assisting clients link existing IT systems and legacy databases with the cutting-edge, no-code technology of Enj. Enj’s breakthrough integration technology transforms the integration process of IT systems that would not talk into a less daunting and time consuming endeavor. The intuitive, object based, no-code writing configuration methodology of Enj translates into a tailored solution on an evergreen basis and for materially less cost. As a process management tool there are further benefits, we streamline with Enj by automating workflows and reconfigure processes for even greater operating economies that eliminate in the future any need for the previously all to familiar work-around fixes and spreadsheet interfaces. Object Based Programing; minimal coding writing Low cost, efficient with rapid delivery. 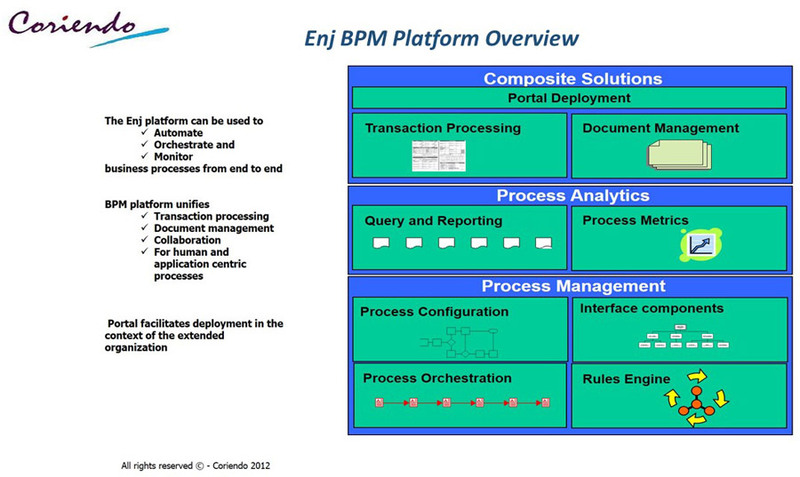 Process Automation; No deployment risk Enj will nimbly configure, automate, and manage business processes and data within and between companies by linking legacy systems and multiple databases that previously would not “talk”. Enj is an infinitely flexible solution for today and tomorrow’s needs. Enj can be configured a process at a time elimination deployment risk. Open World Technology; Scalable Enterprise Solution. Enj runs on any database, server program language, and hardware, efficiently connecting existing systems and databases enabling them to talk. Enj can address targeted needs or comprehensive needs on an enterprise basis. One Product, One Solution Integrates front to back from modeling to transaction orchestration. Enj’s ten modules comprehensively address an enterprise’s business needs such as with from “Enj Transact” for process configuring; “Enj GL” for general ledger interface; “Enj Dashboard” for data warehouse and metrics;”Enj Portal” to link external parties; and “Enj Reporter” for management and external reporting. For a full description of Enj, click here.